Figure A. RPE conjugated Mouse anti Human CD8 (MCA1226PE) and Alexa Fluor 647 conjugated Rat IgG1 isotype control (MCA6004A647). Figure B. RPE conjugated Mouse anti Human CD8 (MCA1226PE) and Alexa Fluor 647 conjugated Rat anti Human CD3 (MCA1477A647). All experiments performed on red cell lysed human peripheral blood gated on leukocytes in the presence of human SeroBlock (BUF070A). Detection of Rat anti CD3 (MCA1477) in an immunohistochemical analysis of an acetone fixed, frozen human spleen section detected using HRP conjugated Goat anti Rat IgG (STAR72). Rat anti Human CD3 antibody, clone CD3-12 (MCA1477) used for the detection of infiltrating T cells in formalin fixed, paraffin embedded kidney tissue sections. Immunohistochemistry for inflammatory cells in kidneys of normal control mice, vehicle-treated mice with anti-GBM-GN, and EGCG-treated mice with anti-GBM-GN. Kidneys from mice 4 weeks after induction of anti-GBM-GN with or without EGCG treatment and kidneys from normal control mice were evaluated for inflammatory cell infiltration. Immunohistochemical analyses showed markedly increased interstitial infiltration of lymphocytes and macrophages in the vehicle-treated group (original magnification x 400). In contrast, the EGCG-treated animals exhibited significantly less interstitial infiltration of lymphocytes and macrophages. No significant inflammatory cell infiltrates were observed in the normal control mice. The number of lymphocyte and macrophages in glomeruli and interstitial compartment are depicted in the bar graphs. Values are mean ± SEM; n = 8–10 in each group. From: Ye T, Zhen J, Du Y, Zhou JK, Peng A, et al. (2015) Green Tea Polyphenol (−)-Epigallocatechin-3-Gallate Restores Nrf2 Activity and Ameliorates Crescentic Glomerulonephritis. Rat anti Human CD3 antibody, clone CD3-12 (MCA1477) used for the detection of CD3 expressing cells in murine tissues by immunohistochemistry on formalin fixed, paraffin embedded tissue sections. From: Flatz L, Rieger T, Merkler D, Bergthaler A, Regen T, et al. (2010) T Cell-Dependence of Lassa Fever Pathogenesis. 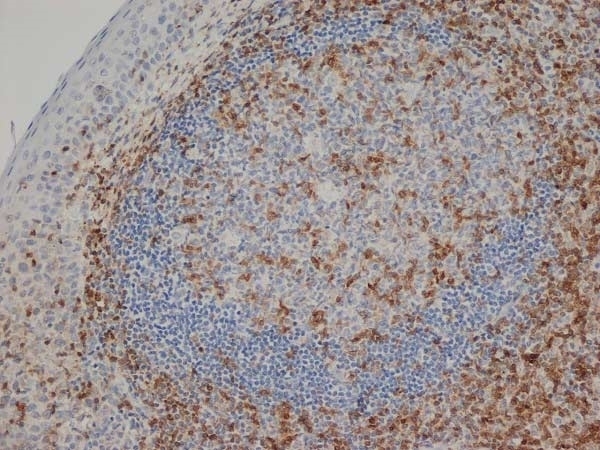 Rat anti Mouse CD3 antibody, clone CD3-12 (MCA1477) used for the detection of CD3 expressing cells in human spleen by immunohistochemistry on formalin fixed, paraffin embedded tissue sections. Rat anti Mouse CD3 antibody, clone CD3-12 (MCA1477) used for the detection of CD3 expressing cells in human bone marrow, spleen and appendix by immunohistochemistry on formalin fixed, paraffin embedded tissue sections. From: de Winde CM, Zuidscherwoude M, Vasaturo A, van der Schaaf A, Figdor CG, van Spriel AB. Multispectral imaging reveals the tissue distribution of tetraspanins in human lymphoid organs. Rat anti Human CD3 antibody, clone CD3-12 (MCA1477) used for the detection of T lymphocytes in mouse nasal associated lymphoid tissue by immunofluorescence. Population of 2W:I-Ab tetramer+ cells detected in situ in NALT co-stained with CD3 but not IgG antibodies. (A) Representative image of a whole NALT section from a GAS-2W infected mouse stained with 2W:I-Ab tetramers (red) with one round of TSA amplification, CD3 antibodies (blue), and IgG antibodies (green). For this image, several confocal z-scan fields were collected using a 20X objective and reconstructed as a montage. The enlargement in (B) shows a 2W:I-Ab tetramer-binding T cell that is co-stained with CD3 antibodies but not IgG antibodies. The enlargement in (C) shows 2W:I-Ab tetramer-binding cells that are not co-stained with CD3 or IgG antibodies. (B) and (C) are confocal z-scans collected using the same parameters with a 60X objective and zoom of 3. 2W:I-Ab tetramer+CD3+IgG- cells are indicated with arrowheads, and 2W:I-Ab tetramer+CD3-IgG- cells are indicated with arrows. 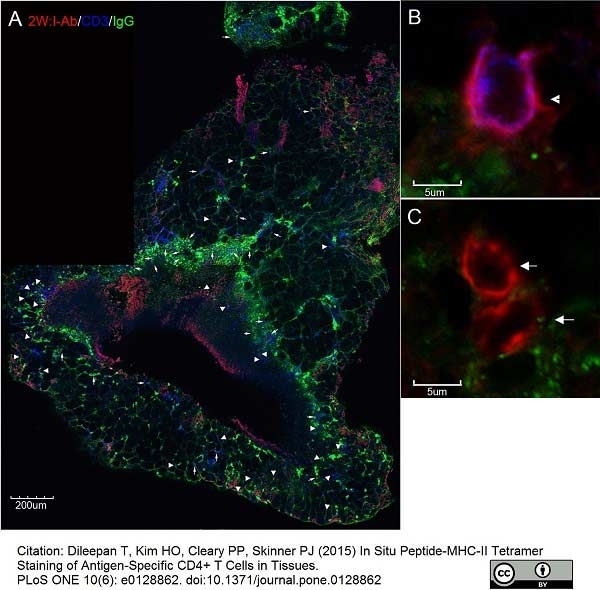 In Situ Peptide-MHC-II Tetramer Staining of Antigen-Specific CD4+ T Cells in Tissues. PLoS ONE 10(6): e0128862. Rat anti Human CD3ε antibody, clone CD3-12 (MCA1477) used to identify CD3ε expressing cell by immunofluorescence on formalin fixed, paraffin embedded tissue sections. CD3+ cells in the lungs following primary infection and reinfection. Immunofluorescence (IF) image of CD3 (green) and virus antigen (red) within the same perivascular region following reinfection (C). IF images at 40x, bar equivalent to 20μm. 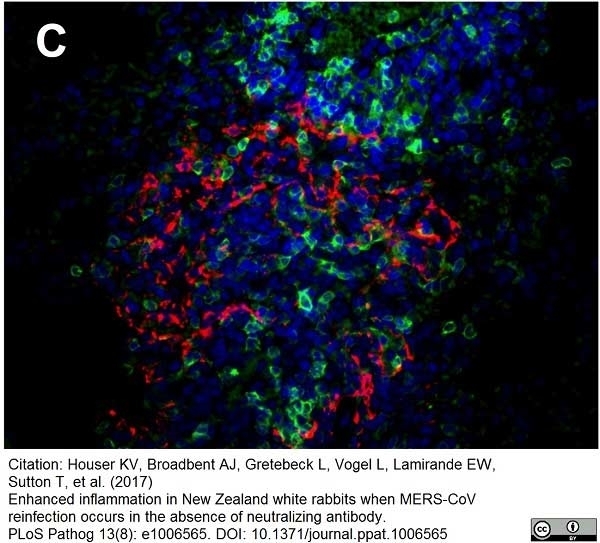 Enhanced inflammation in New Zealand white rabbits when MERS-CoV reinfection occurs in the absence of neutralizing antibody. Rat anti Human CD3ε antibody, clone CD3-12 (MCA1477) used to identify CD3ε expressing cell by immunohistochemistry on formalin fixed, paraffin embedded tissue sections. DAB images from primary infection (A) and reinfection (B). DAB images from day 3 post-infection at 10x, bar equivalent to 100μm. Rat anti Human CD3ε antibody, clone CD3-12 (MCA1477) used to illustrate CD3 positive cells at the peak of the inflammatory response in ears of imiquimod treated mice by immunohistochemistry on formalin fixed, paraffin embedded tissue sections. Characterization of the inflammatory infiltrate in IMQ-treated ears. Representative anti-Ly6G, anti-CD3 stained sections are shown for IMQ-treated WT ears at the peak of inflammation on day 7. Representative anti-Ly6G (brown staining, left panels) and anti-CD3 (brown staining, right panels) stained sections are shown for IMQ-treated ears of WT (upper panels) or Il-38-/- (lower panels) littermate mice at the peak of inflammation on day 7 (C). Scale bar = 100 μm. 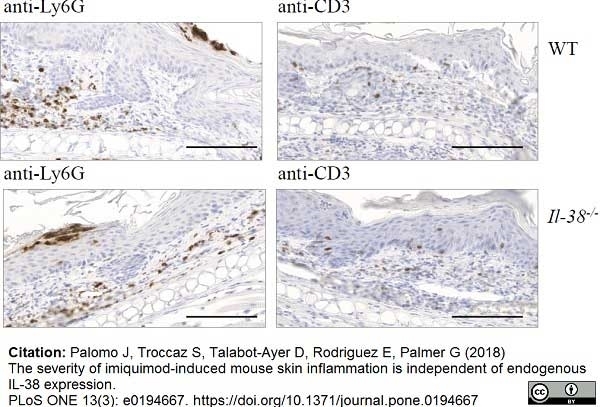 The severity of imiquimod-induced mouse skin inflammation is independent of endogenous IL-38 expression. AlexaFluor® 647 conjugated Rat anti Human CD3 antibody, clone CD3-12 (MCA1477A647) used for identifying CD3 expressing lymphocytes by flow cytometry. From: DeClue AE, Axiak-Bechtel SM, Zhang Y, Saha S, Zhang L, Tung DD, Bryan JN. inflammatory response to C. Novyi-NT bacteriolytic immunotherapy. BMC Vet Res. 2018 Apr 2;14(1):119. CD3 antibody, clone CD3-12, recognizes human CD3e, and has a very broad species crossreactivity for the CD3 marker. CD3 is a multimeric protein complex composed of four distinct polypeptide chains that associate with the T cell receptor (TCR). Rat anti Human CD3, clone CD3-12 raised against a peptide representing an invariant cytoplasmic sequence within the CD3ε chain recognizes human CD3ε. CD3 is a multimeric protein complex composed of four distinct polypeptide chains (ε, γ, δ, ζ) that assemble and function as three pairs of dimers (εγ, εδ, ζζ). The CD3 complex serves as a T cell co-receptor that associates non-covalently with the T cell receptor (TCR) (Malissen 2008; Guy and Vignali 2009; Smith-Garvin et al. 2009). CD3 is a defining feature of cells belonging to the T cell lineage and can therefore be used as T cell marker. As Rat anti Human CD3, clone CD3-12 has been specifically raised against an epitope within the epsilon peptide chain, highly conserved among species clone CD3-12 has a very broad species crossreactivity for the CD3 marker. (Jones et al. 1993; Kothlow et al. 2005). 1Membrane permeabilization is required for this application. Bio-Rad recommends the use of Leucoperm™ (BUF09) for this purpose. 2This product requires antigen retrieval using heat treatment prior to staining of paraffin sections. Tris/EDTA buffer pH 9.0 is recommended for this purpose. Where this antibody has not been tested for use in a particular technique this does not necessarily exclude its use in such procedures. Suggested working dilutions are given as a guide only. It is recommended that the user titrates the antibody for use in their own systems with appropriate negative/positive controls. Jones, M. et al. (1993) Detection of T and B cells in many animal species using cross-reactive anti-peptide antibodies. J Immunol. 150 (12): 5429-35. Shulga-Morskaya, S. et al. (2004) B cell-activating factor belonging to the TNF family acts through separate receptors to support B cell survival and T cell-independent antibody formation. J Immunol. 173 (4): 2331-41. Kapturczak, M.H. et al. 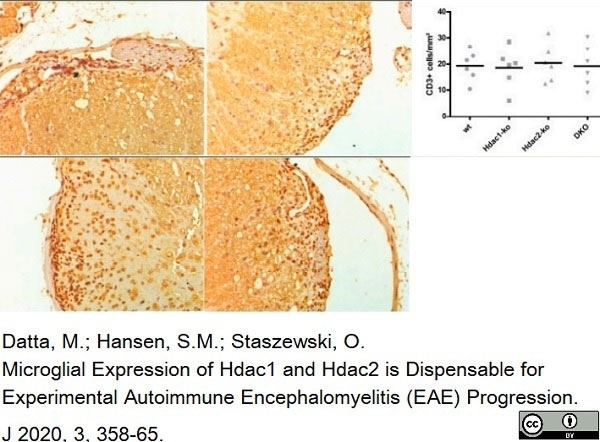 (2004) Heme oxygenase-1 modulates early inflammatory responses: evidence from the heme oxygenase-1-deficient mouse. Am J Pathol. 165 (3): 1045-53. Kothlow, S. et al. (2005) Characterization of duck leucocytes by monoclonal antibodies. Dev Comp Immunol. 29 (8): 733-48. Patole, P.S. et al. (2006) Expression and regulation of Toll-like receptors in lupus-like immune complex glomerulonephritis of MRL-Fas(lpr) mice. Nephrol Dial Transplant 21 (11): 3062-73. Foryst-Ludwig, A. et al. (2010) PPARgamma activation attenuates T-lymphocyte-dependent inflammation of adipose tissue and development of insulin resistance in obese mice. Osorio, Y. et al. (2011) Identification of small molecule lead compounds for visceral leishmaniasis using a novel ex vivo splenic explant model system. PLoS Negl Trop Dis. 5:e962. Flatz, L. et al (2011) T cell-dependence of Lassa fever pathogenesis. Gendronneau, G. et al. (2010) Influence of Hoxa5 on p53 tumorigenic outcome in mice. Am J Pathol. 176: 995-1005. Herrmann, I. et al. (2006) Streptococcus pneumoniae Infection aggravates experimental autoimmune encephalomyelitis via Toll-like receptor 2. Ruf, M.T. et al. (2012) Chemotherapy-Associated Changes of Histopathological Features of Mycobacterium ulcerans Lesions in a Buruli Ulcer Mouse Model. Antimicrob Agents Chemother. 56: 687-96. Roy, M. et al. (2012) CXCL1 can be regulated by IL-6 and promotes granulocyte adhesion to brain capillaries during bacterial toxin exposure and encephalomyelitis. Campuzano, O. et al. (2012) Arrhythmogenic right ventricular cardiomyopathy: severe structural alterations are associated with inflammation. J Clin Pathol. 65 (12): 1077-83. Lau, Q. et al. (2012) Expression and in vitro upregulation of MHCII in koala lymphocytes. Vet Immunol Immunopathol. 147: 35-43. Beineke, A. et al. (2007) Phenotypical characterization of changes in thymus and spleen associated with lymphoid depletion in free-ranging harbor porpoises (Phocoena phocoena). Vet Immunol Immunopathol. 117: 254-65. Pusterla, N. et al. (2006) Multicentric T-cell lymphosarcoma in an alpaca. Fuller, C.L. et al. (2003) In situ study of abundant expression of proinflammatory chemokines and cytokines in pulmonary granulomas that develop in cynomolgus macaques experimentally infected with Mycobacterium tuberculosis. Singleton, C.L. et al. (2007) Diagnosis and treatment of chronic T-lymphocytic leukemia in a spotted hyena (Crocuta crocuta). J Zoo Wildl Med. 38: 488-91. Colegrove, K.M. et al. (2010) Polyomavirus infection in a free-ranging California sea lion (Zalophus californianus) with intestinal T-cell lymphoma. J Vet Diagn Invest. 22: 628-32. Steinberg, J.D. and Keating, J.H. (2008) What is your diagnosis? Cervical mass in a cat. Vet Clin Pathol. 37: 323-7. Osofsky, A. et al. (2011) T-cell chronic lymphocytic leukemia in a double yellow-headed Amazon parrot (Amazona ochrocephala oratrix). J Avian Med Surg. 25: 286-94. Giannitti, F. et al. (2014) Temporal and geographic clustering of polyomavirus-associated olfactory tumors in 10 free-ranging raccoons (Procyon lotor). Vet Pathol. 51 (4): 832-45. Malka, S. et al. (2008) Disseminated lymphoma of presumptive T-cell origin in a great horned owl (Bubo virginianus). J Avian Med Surg. 22: 226-33. Bricker, N.K. et al. (2012) Cytochemical and immunocytochemical characterization of blood cells and immunohistochemical analysis of spleen cells from 2 species of frog, Rana (Aquarana) catesbeiana and Xenopus laevis. Vet Clin Pathol. 41: 353-61.
de Winde, C.M. et al. 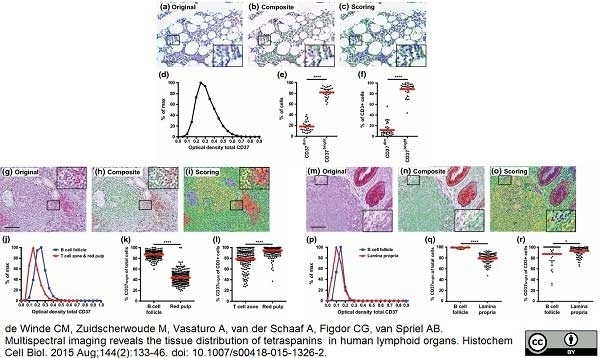 (2015) Multispectral imaging reveals the tissue distribution of tetraspanins in human lymphoid organs. Histochem Cell Biol. 144 (2): 133-46. Muljono, A. et al. (2009) Primary cutaneous lymphoblastic lymphoma in children: series of eight cases with review of the literature. Sommer, A. et al. (2016) Infiltrating T lymphocytes reduce myeloid phagocytosis activity in synucleinopathy model. J Neuroinflammation 13 (1): 174. Velu, V. et al. 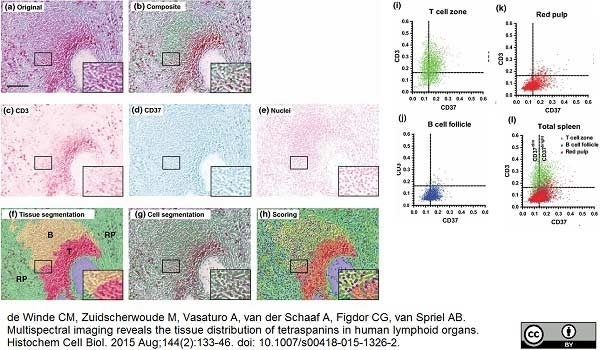 (2016) Induction of Th1-Biased T Follicular Helper (Tfh) Cells in Lymphoid Tissues during Chronic Simian Immunodeficiency Virus Infection Defines Functionally Distinct Germinal Center Tfh Cells. Wen, J. et al. (2015) TNF-like weak inducer of apoptosis promotes blood brain barrier disruption and increases neuronal cell death in MRL/lpr mice. Sample, S.J. et al. (2017) Radiographic and magnetic resonance imaging predicts severity of cruciate ligament fiber damage and synovitis in dogs with cranial cruciate ligament rupture. PLoS One. 12 (6): e0178086. Kallikourdis, M. et al. (2017) T cell costimulation blockade blunts pressure overload-induced heart failure. Bonnefont-Rebeix, C. et al. (2016) Characterization of a novel canine T-cell line established from a spontaneously occurring aggressive T-cell lymphoma with large granular cell morphology. Montes-Cobos, E. et al. (2017) Targeted delivery of glucocorticoids to macrophages in a mouse model of multiple sclerosis using inorganic-organic hybrid nanoparticles. J Control Release. 245: 157-169. Bartlett SL et al. (2010) Intestinal lymphoma of granular lymphocytes in a fisher (Martes pennanti) and a Eurasian otter (Lutra lutra). J Zoo Wildl Med. 41 (2): 309-15. Houser, K.V. et al. (2017) Enhanced inflammation in New Zealand white rabbits when MERS-CoV reinfection occurs in the absence of neutralizing antibody. PLoS Pathog. 13 (8): e1006565. Sparger, E.E. et al. (2018) Investigation of immune cell markers in feline oral squamous cell carcinoma. Vet Immunol Immunopathol. 202: 52-62. Palomo, J. et al. (2018) The severity of imiquimod-induced mouse skin inflammation is independent of endogenous IL-38 expression. PLoS One. 13 (3): e0194667. Declue, A.E. et al. (2018) Identification of immunologic and clinical characteristics that predict inflammatory response to C. Novyi-NT bacteriolytic immunotherapy. BMC Vet Res. 14 (1): 119. DaSilva, A.V.A. et al. (2018) Morphophysiological changes in the splenic extracellular matrix of Leishmania infantum-naturally infected dogs is associated with alterations in lymphoid niches and the CD4+ T cell frequency in spleens. PLoS Negl Trop Dis. 12 (4): e0006445. Withers, S.S. et al. (2018) Multi-color flow cytometry for evaluating age-related changes in memory lymphocyte subsets in dogs. Dev Comp Immunol. 87: 64-74. Basu, A. et al. (2019) Association of PD-L1, PD-L2, and Immune Response Markers in Matched Renal Clear Cell Carcinoma Primary and Metastatic Tissue Specimens. Am J Clin Pathol. 151 (2): 217-25. Alterio de Goss, M. et al. 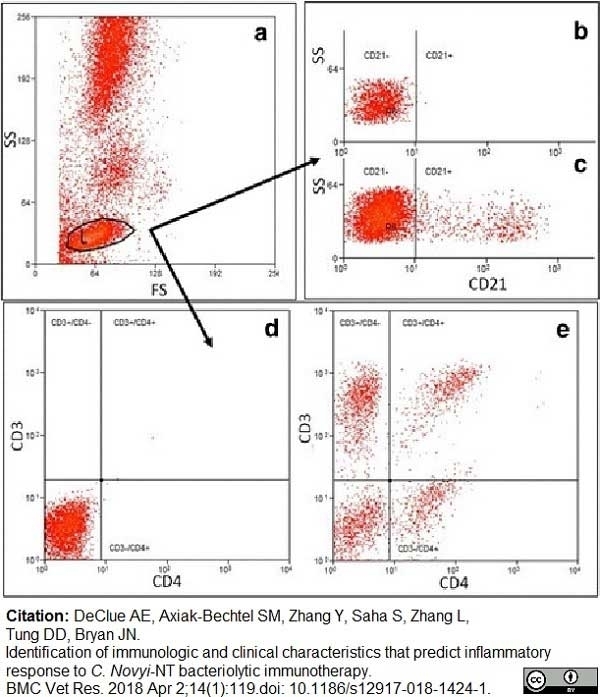 (1998) Control of cytomegalovirus in bone marrow transplantation chimeras lacking the prevailing antigen-presenting molecule in recipient tissues rests primarily on recipient-derived CD8 T cells. J Virol. 72 (10): 7733-44. Burudi, E.M. et al. (2002) Regulation of indoleamine 2,3-dioxygenase expression in simian immunodeficiency virus-infected monkey brains. J Virol. 76 (23): 12233-41. Piriou-Guzylack, L. (2008) Membrane markers of the immune cells in swine: an update.